Next year Ivan Kristoff and partners plan to open a new chapter in the aviation safety and air rope rescue – all at extreme heights. The High-rise Emergency Response Team (HEART), which completed the first rope access on the top of the world’s highest tower in 2003. Now, a decade later, a new challenge lays ahead. 2014 will be remembered with an increased series of missing airplanes. Most of them have crashed in the waters, but the history knows of many airplanes that have crashed in the high mountains, like the 1972 Andes flight disaster. The team will join forces with some of the best professional, military and police pilots, to develop and implement new kinds of air rescue into a specialized training program and create a new High-altitude Emergency Response Team. It’s main mission will be to respond to high-altitude SAR around the world. Ever since last century, extreme rope access technicians first look up at the top of the CN Tower, the tallest tower in the world, we dreamed of working up there. Back in in 2003, that dream became real when the first human set foot on the exterior of the Antenna Mast – the tallest in the world, the top of the CN Tower. That was me. And when I stood up there on the top of the urban world, I realized what would be the challenges for a steady helicopter hovering maneuvers and precise rope rescue or aerial extraction of people. And in a short time with a team of pilots and air crew man will make High Reference air rescue training. This will be one of the rope rescuer’s most ambitious undertakings. The direct result of a decade’s long global space race and of a joint mission, created to extend human exploration to the farthest reaches of rope rescue. This will be a joint mission to created to extend human exploration to the farthest reaches of rope rescue. This will be the story of the Extraordinary New TV Series – the greatest adventure that will show the most complex air rescue operations ever. People rely on Police and Fire Department emergency services and even Special Forces to rescue people in need from the top of the tallest high-rises. We can show how we can create a team that goes beyond the expectations of people. But make no mistake! This is no easy journey. The process of training a high rise emergency aerial rescue team is as dangerous and challenging as anything we’ve ever tried. For the pilot to hover precisely near the spear of towers and buildings a few hundred meters over the ground is a big challenge. Up there even the lightest movement of the hand of the pilot over the joystick, will move the helicopter a few meters aside. It is too high to have a visual reference in the special positioning of the helicopter. The rope rescue technician must have a lot of experience in hostile and extreme environment in order to make successful the very first helicopter air rescue training at the height above the Burj Khalifa. A specialized rescue team is the one that will succeed from the very first time. There is no space for errors. Rope access technicians must overcome the psychological barriers and challenges for such mission. 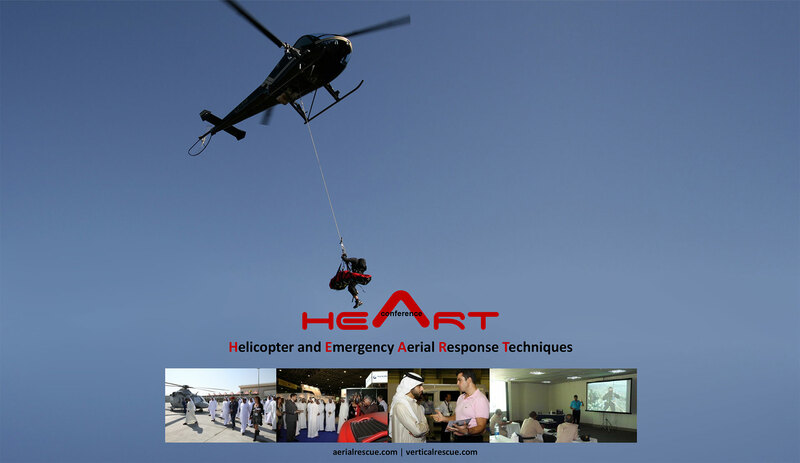 One mistake can jeopardize not only the lives of the team… Despite those challenges, the team will thoroughly investigate new ways of air rescue and follow he HEART training program and will take you to a new adventure that will take us at even higher levels.